Muhammadi Dawakhana & Pansar Store is located in Adeel Plaza, G9 Markaz, Islamabad. 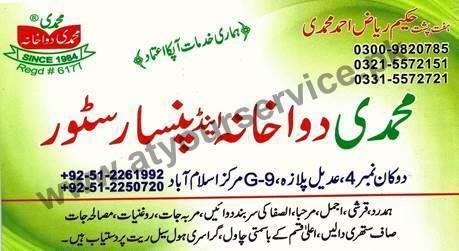 We sell all products of Hamdard, Qarshi, Marhaba, and Al-Safa. We also sell all kind of herbs and herbal medicines, spices, basmati rice, and some grocery items.